A couple of years ago I found this great EASY recipe for puff pasty from Flour Me with Love and I've been making them ever since. 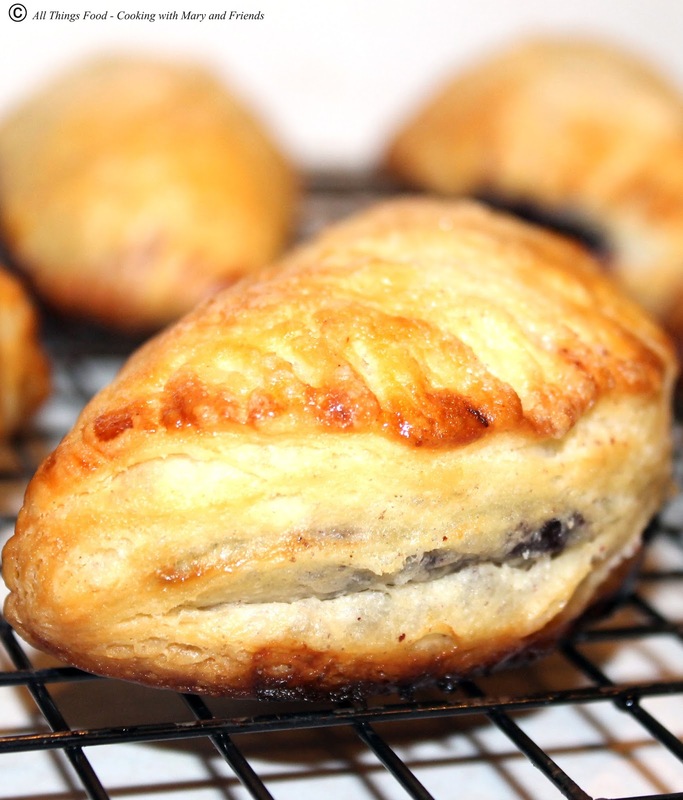 The recipe is easy to follow and simplifies the whole tedious puff pasty process into one very simple to follow recipe. 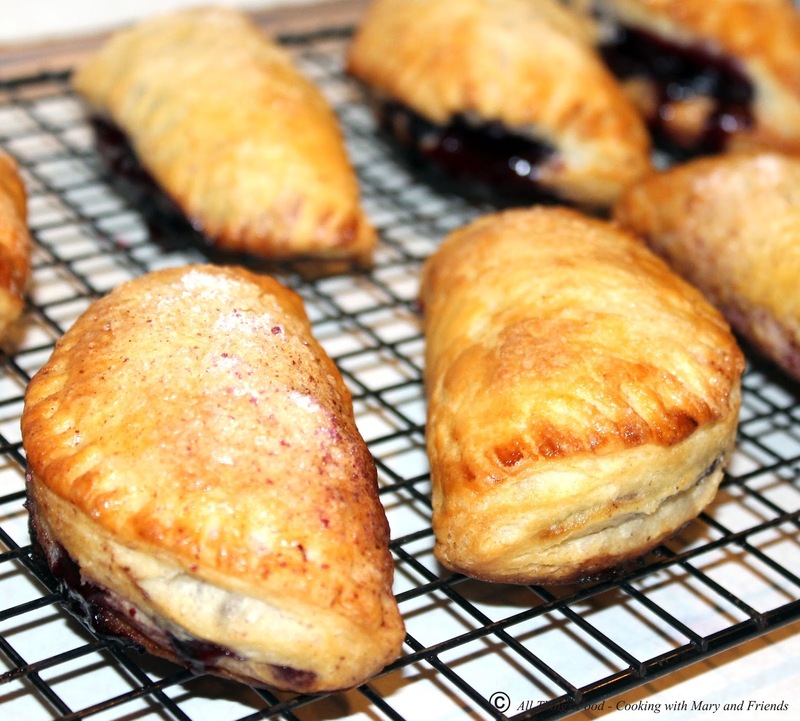 These Blueberry Turnovers use that simple puff pastry recipe and homemade blueberry pie filling, or fresh homemade pie filling, and is amazingly delicious! Luscious flaky layers of sugary pastry filled with sweet and tangy blueberry pie filling = a flavor burst in your mouth! To make the puff pastry: In a large mixing bowl, combine the flour, salt, baking powder and sugar. Add the cut butter slices and using the paddle blade, cut the butter into the flour until it resembles large crumbs. Mix in sour cream just until the dough begins to come together. 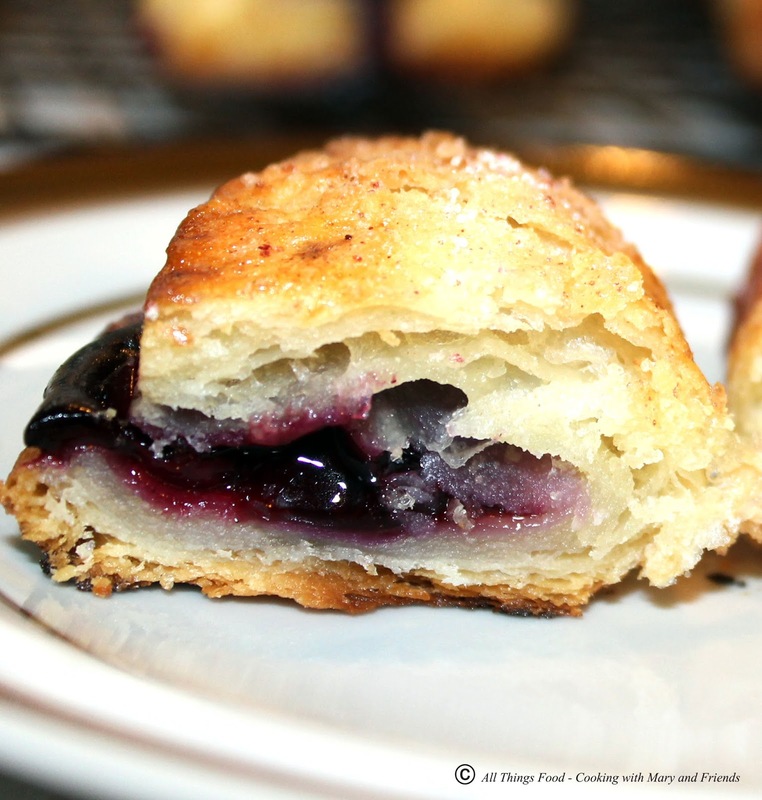 To make the filling: (skip this step if using already canned homemade blueberry pie filling). Mix the sugar and Clear Jel till well combined. If you're using cornstarch, mix it with enough cold water to dissolve. Add the sugar mixture to the blueberries, tossing to combine. Stir in the vanilla and cinnamon (and the cornstarch/water mixture, if you're using cornstarch). Heat the mixture in a saucepan over very low heat, stirring, till the berries soften and fall apart. The mixture will be thick and jam-like, even though it doesn't really warm up much; this will take under 5 minutes. If you use cornstarch, cook and stir till the mixture bubbles and thickens. You can prepare the filling up to several days before; cover and refrigerate till you're ready to use it. You can also do this in a microwave; heat till the berries soften, then stir till they fall apart and the mixture thickens, like jam. To assemble and bake: Preheat the oven to 400 degrees. Roll the chilled dough into a 16" square. Cut 4 or 5 - 4 1/2-inch rounds. Re-roll the dough scraps, and cut 4 or 5 additional rounds, as many as you can get out of the scraps. If desired, for a tighter seal, brush two adjoining edges of each circle with 1 egg beaten with 1 tablespoon cold water. Place about 2-4 tsp filling slightly off-center in each square. 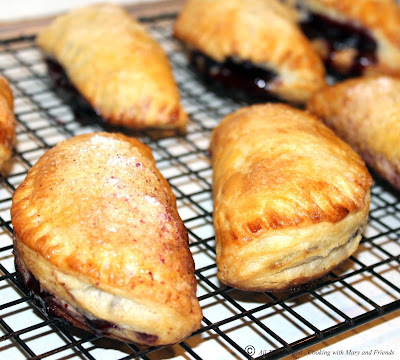 Fold the turnovers in half. Press the edges with a fork to seal. Place the turnovers on a baking sheet sprayed lightly with cooking spray or lined with parchment to catch any spills. Brush tops with egg wash and sprinkle with coarse sugar. Bake 20 to 25 minutes, or until they're a deep, golden brown; you will see some of the filling beginning to ooze out. Remove the turnovers from the oven, and cool on a rack. Serve warm, or at room temperature. For a really decadent treat, serve with a side of vanilla bean ice-cream.